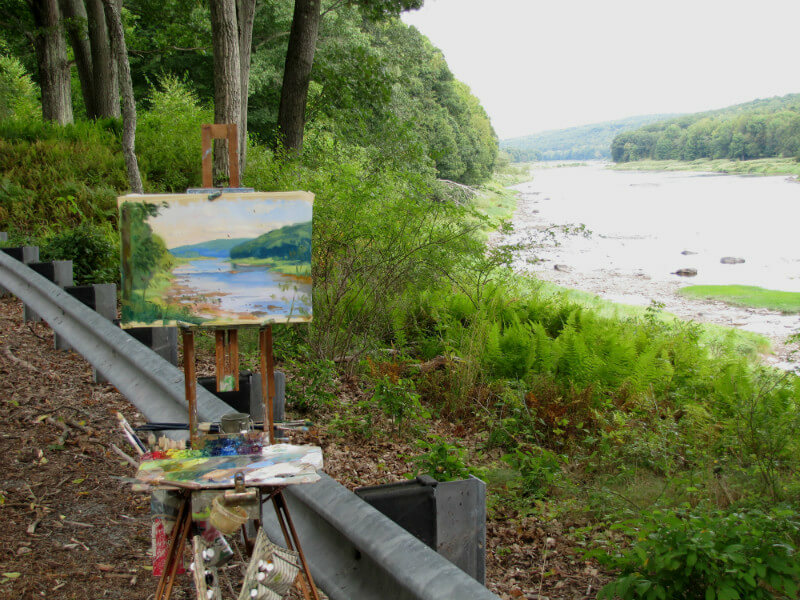 Last week, I found a beautiful spot along the Delaware River that really gave a feeling of immensity and grandeur. As I was sketching, I met a man whose mother lived across the street. He came out thinking I was having car trouble only to realize that I was sketching. He was very kind and offered me all sorts of insight into the local history of the river, the return of the bald eagles and the drama of past floods. I love this kind of encounter because it has become so rare to find people who are actively attached to the land and speak from a point of view that expresses their love of place. 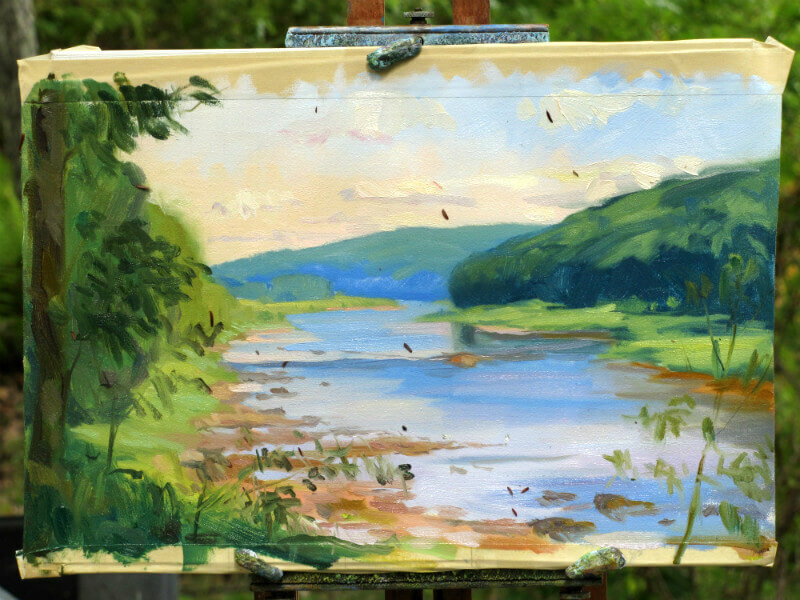 He was a kindred spirit in a way and happily gave me permission to paint on his mother’s property. Today, I went out again to this spot early in the morning. It was a bright rich morning with sparse clouds moving in from the west. This view is very large and I know that I would like to paint a large canvas on site. So today, I went out to study the composition as well as the color. So before I left my studio, I took a scrap piece of canvas, 10X17 equal in proportion to the canvas I plan to use, 24X36. 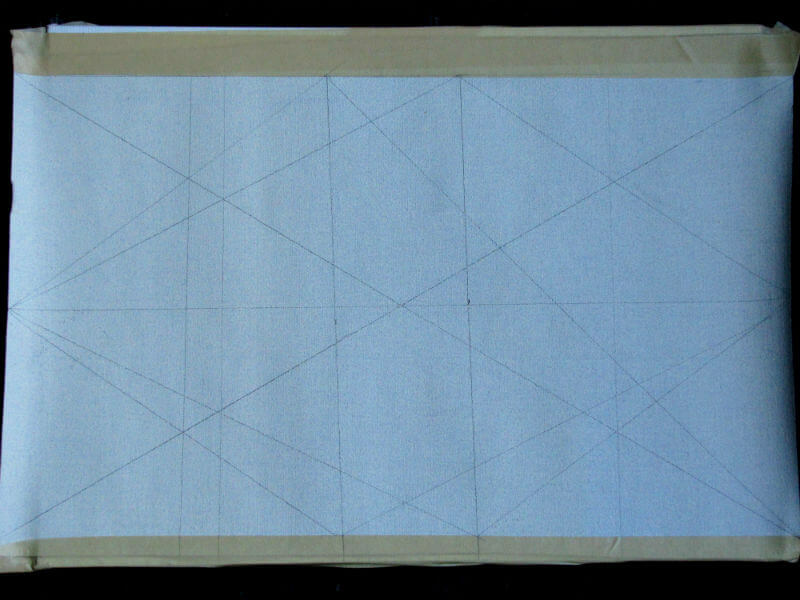 I divided the plane of the canvas using rabatment lines to create divisions with verticals, horizontals and diagonals (I drew this in pencil, which one should not do, as over time the lead works its way through the oil paint, but I wanted it to be visible for the photo). Sometimes I will spontaneously use rabatment in this way to see if I can fortify my composition on the spot to improve my over-all design or to create more drama in the composition. But in most cases, I have an image in mind and I wish to strengthen it and add an over-layer in the design in which I need strategies to deal with the complexity of the composition. In my last blog of the waterfall seen through the trees, is just such a case. In this image, one can see how the rabatment lines are first built on an over-lapping square (this is the narrow rectangle in the middle. Most 19th century artists used this as the primary means to create the strength of a square in a composition. George Bellows’ work is a good place to look because many of his large landscapes of the East River use this). But I love diagonals because one is drawn into an image immediately and it gives a flowing quality to a composition. As one can see there are a series of diagonals (there are more that one can create) and these diagonals help concentrate the image toward the center. But the verticals also frame the image and that concentrates the composition as well. In this image, I have drawn the main focal point of the image hovering above the horizontal center line. I also have the river departing to the right of center both horizontally and vertically. So the focal point is going to be above the center horizontal and travel behind the shadowed trees that rest on the vertical. This should create a feeling of wishing to see around the corner. The vertical on the left side holds back the very far hill on the left and the next vertical over to the left holds back the large mass of trees on the left bank. The hill on the right at the focal point derives its top edge along the diagonal reaching to the right corner. This is the main diagonal as it cuts through the center to the opposing corner. 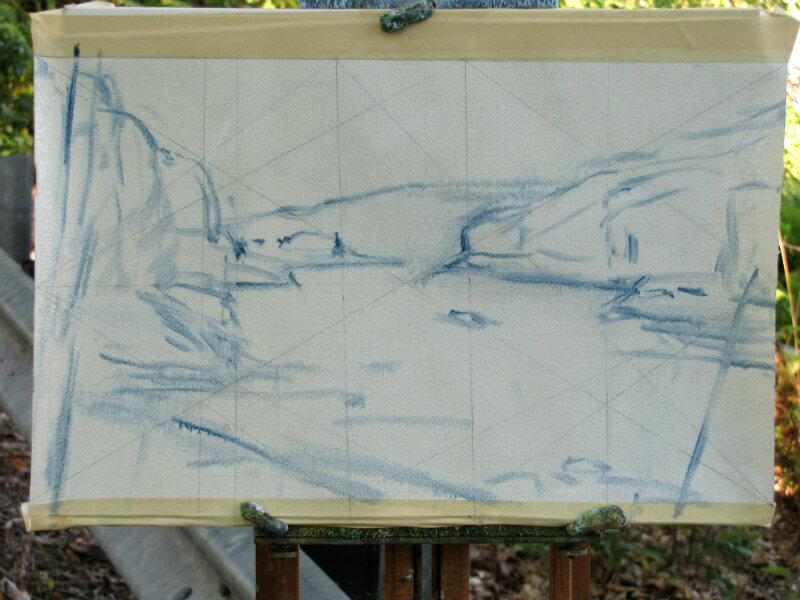 Next, looking at the bottom of the canvas, I have used the diagonal in the right lower corner to acts as the direction of the flow of the river which intersects with the mid-river rock which will act as a force to focus the eye toward the focal point. This diagonal also forms the top edge of the trees on the left bank. On the lower left, I have taken the diagonal that reaches from the center (on the bottom edge of the canvas) and extends to the left edge of the canvas center and used this to indicate the near bank on which I am standing. On this bank I would like some trees in shadow to cut through the composition to give a greater feeling of distance. These trees will follow the perspective lines of the diagonals that descend from the right top to the left bottom. This all sounds more complicated than it is practically. Once you have the lines sketched on the canvas it is a matter of slight adjustment to align one’s composition along these power points. Next, I worked on a color triad that would fit the lighting situation as well as convey that sparkling quality in this day. I chose B-Y-VR. This is in a minor key which I hope adds a little longing to a moment that I wish to hold on to. The major color prevalent in this scene is blue. It is everywhere and especially in the receding focal area. There is also yellow in the sky as well as all the greens. So blue and yellow and all the intervening greens anchor the composition. The violet-red acts as a relief and adds sparkle to the sky and water. It is also evident in the rocks along the shore. Again, blue is prevalent everywhere and I wanted to maximize its effect. I added a feeling of “radiating” color (as Henri described it) with the blue. So I added blue Bi and blue Hue to the mix. Therefore, blue appears in 3 different intensities throughout the composition. As you see, this is just a study or what the French would call an etude, its purpose to carry the idea without worrying about details. I can already see the things I need to change, plus those pine needles stuck to the paint are a little distracting. Onto the large canvas.